Where cities take control of their energy choices, utilities face a stark choice: join or die. On June 8, 2017, San Diego, Calif., became the 30th U.S. city committed to getting 100% of its power from renewable energy. Just six months later, on Nov. 29, Truckee, Calif., became the 50th city to make the pledge. Recently, former President Barack Obama applauded the 45-plus Mayors who signed the just-released Chicago Climate Charter endorsing the Paris agreement. The pact called for specific policies and actions to reduce emissions, including using more renewables. This growing momentum is driven by two key factors, according to Jodie Van Horn, Executive Director of Ready for 100, a division of the Sierra Club pushing 100% renewables. One is a widening range of cost-effective renewables options. The other is the threat of selling less power. Ready for 100’s just-released 2017 Case Study Report shows that many utilities realize they must either work with municipalities to deliver the power mix customers want or lose the customers, Van Horn told Utility Dive. It also shows that some utilities have not seen the handwriting on the wall — the rising power of municipalization or the threat of the Community Choice Aggregation (CCA) movement. 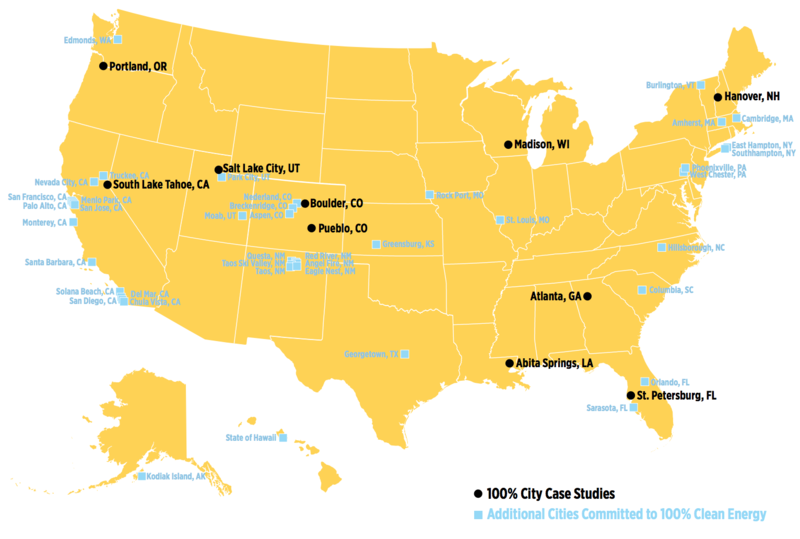 Bolded cities are highlighted in the Sierra Club's Ready for 100% report. Many utilities are responding cooperatively to cities’ 100% renewables commitments, Van Horn said. They are offering green pricing programs, community renewable energy programs and bilateral contracts through green tariffs. “They see that those who partner are going to have a bright future and those that resist are going to find themselves with a shrinking customer base,” Van Horn said. Where utilities don’t cooperate, cities are taking control. They are subscribing as anchors in independently-developed solar projects, helping large corporate customers obtain power purchase agreements (PPAs) for renewables and supporting the emergence of CCAs. Georgetown, Texas, Mayor Dale Ross (R) said his Austin suburb’s municipal utility was one of the first to get 100% of its power from renewables. Through its 25-year wind PPA, approved by the City Council in 2014, Georgetown achieved its 100% goal last year. In 2008, Georgetown’s average electricity rate was $0.115/kWh, Ross said. It’s current average rate is $0.084/kWh. Further to the North, Van Horn said Portland General Electric (PGE) stood out as an IOU for supporting the Portland, Oregon, move to 100% renewables. Spokesperson Steven Corson said PGE is partnering with the City of Portland and the County to get to 100% renewable electricity by 2035 and 100% renewable energy for all purposes by 2050. It was clear both regulators and most stakeholders wanted PGE to move to renewables rather than build new fossil generation, Corson said. Ameren Missouri is another IOU that has shown leadership, Van Horn said. After St. Louis became the biggest Midwestern city to commit to 100% renewables, Ameren filed a program that will allow customers to sign 15-year agreements with the utility for new wind capacity that Ameren would build. In 2016, Salt Lake City, Utah, committed to 100% renewables by 2032. Mayor Jackie Biskupski (D) then leveraged renegotiation of the city’s franchise agreement with utility Rocky Mountain Power (RMP), which expired in 2016, to obtain a commitment of cooperation. The city accepted a new 5-year franchise agreement and the utility committed to the 100% goal. RMP spokesperson Spencer Hall said the utility and the City collaborated on “an achievable implementation plan.” Its focuses are energy efficiency, renewables, electric vehicles, and a progressive grid, which align with “PacifiCorp’s commitment to renewable energy,” he added. The August 2016 Cooperation Statement signed by Biskupski and RMP CEO Cindy Crane specifically acknowledged that financial impacts, including costs and benefits, will be the city's responsibility and will not impact other RMP customers, Hall noted. Van Horn said franchise agreement renegotiation has been used by other cities to obtain new terms from the incumbent utility. “It looks a lot better for the utility when the headline is that it is partnering with the city than that it is opposing the city and its citizens,” she said. Van Horn said Boulder, Colo., is the furthest toward forming its own municipal utility to achieve ambitious energy and climate goals. Voters have been funding the effort to separate from Xcel Energy since 2010. In September 2017, the Colorado Public Utilities Commission finally approved municipalization. In November, Boulder voters again endorsed the move. In Pueblo, Colo., the battle is newer and uglier. The City Council voted to join the 100% renewables movement and to study municipalization and termination of their Black Hills Energy (BHE) franchise agreement. The decision came after BHE resisted the changes Pueblo’s citizens wanted. BHE’s development of natural gas infrastructure drove Pueblo rates so high that, in 2016, an estimated 7,000 residents, out of a customer base of 94,000, were disconnected for failure to pay, the Case Studies paper reported. BHE disconnects customers only as “a last resort,” Rodriguez added. In 2016, it disconnected 7,229 service agreements for nonpayment but restored 5,134 of them, she said. In Q4 2016, the utility disconnected 1,212 individual customers and reconnected 1,160 in the same quarter. Nonpayment is one of many reasons for fewer reconnects, she said. Five states have active CCAs and all grew in 2016, according to researchers at the National Renewable Energy Laboratory. Illinois led the U.S. with over two million CCA participants. Massachusetts CCA participation had the biggest percentage growth. California’s CCAs added the most MWh of renewables sales. By the end of 2017, a third or more of California’s IOU customers will get electricity from non-utility retail providers, and CCAs will have a total of 915,000 customers. According to a recent white paper from the California Public Utilities Commission (CPUC), cities and counties with a total population of more than 15 million are now considering CCAs. The California CCA law requires that all utility customers automatically be moved to a CCA when one is formed by a community. More than 85% of retail load could be served “by sources other than the IOUs” by the middle of the 2020s, CPUC Staff reported. Staff questioned whether the CPUC has the same authority to impose mandates and policies on CCAs as it has over IOUs. An ongoing proceeding will settle the pivotal question of the Power Charge Indifference Adjustment (PCIA). The question is whether the CPUC can authorize utilities to use the PCIA on CCA customer bills to recover investments made to serve those departing customers. The PCIA increases CCA rates, which are now slightly lower than incumbent utilities’ rates. Low rates are one reason an average of only 15% of CCA customers return to incumbent utilities. An NREL survey found a 2015 PCIA approved for Pacific Gas & Electric appears to have increased that to 27%. ​After San Diego announced its 100% renewables by 2035 goal, it initiated a study of the feasibility of procuring generation through a CCA. The distribution system of San Diego Gas and Electric (SDG&E), the state’s third biggest IOU, would be the new CCA's delivery infrastructure. A San Diego CCA would begin with 1.3 million SDG&E customers. That would make it the biggest existing CCA, though CCAs in development in Los Angeles and San Jose will rival it. The feasibility study concluded it could achieve the city’s targeted emissions reductions and deliver 100% renewables at rates competitive with SDG&E. The study also found a San Diego CCA would be “reliably solvent and financially feasible.” Net margins would be negative initially but turn positive within the first 5 years to 7 years and remain positive. The CCA would be financially sound enough to invest in local distributed generation, energy efficiency, demand response, and other demand-side management initiatives, the study found. It would also provide net local economic benefits. An alternative plan from SDG&E is under study by the mayor’s office. Its details remain unpublished but inside political moves by Mayor Kevin Faulconer (R) suggest he is protecting the CCA from the political influence of the utility, according to local news outlet Voice of San Diego. All three of California’s dominant IOUs have frequently told Utility Dive they support customer choice and are willing to work to support public policy goals. They have, however, resisted CCA efforts to alter the PCIA because of the departing load impact highlighted by the feasibility study. Whether SDG&E will go the way forged by PGE and RMP or follow BHE into resistance remains to be seen.